Oh my.... I love, love, love creating Water Color Journals! Been working on a project using antique Art History Books, removing the pages and using the covers for the front and backs of some really big Water Color Journals. I want to use the best, so I'm using 140 pound professional paper.... really, really nice. I'm not going to show those here, yet. 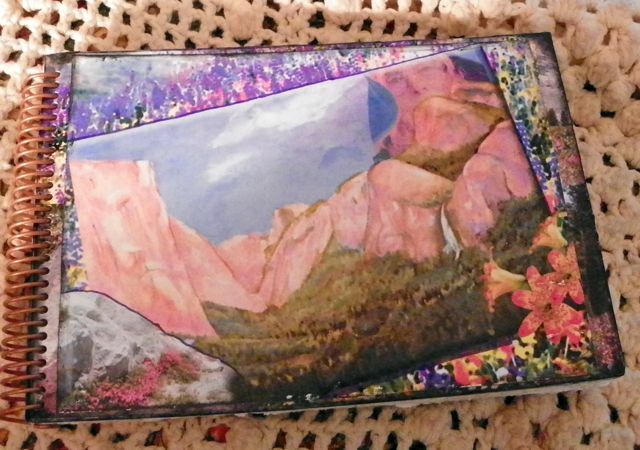 Not wanting to waste a pinch of paper, so I'm using the 3" and 4" scraps,by also creating some really small journals to carry in a purse or art bag. These will be about 3x6 inches or so. 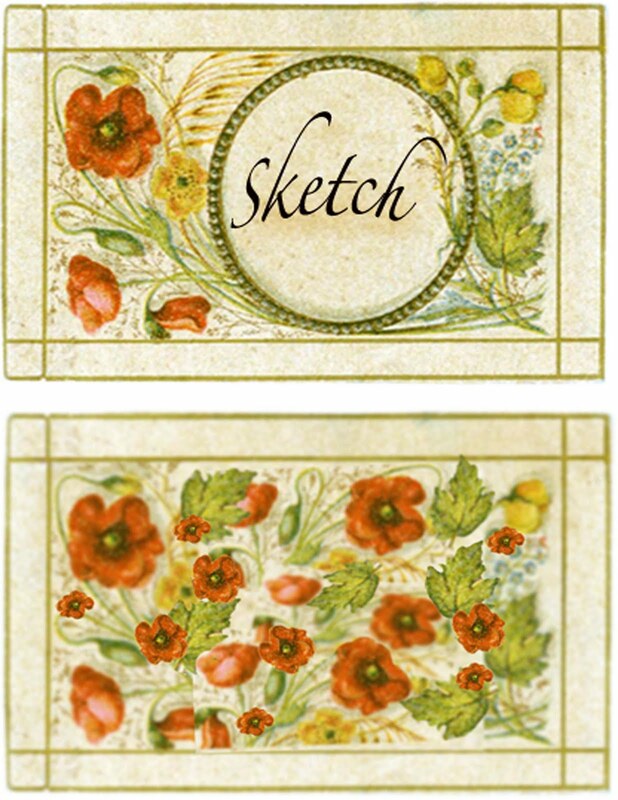 Landscape style, perfect for Visual Journals. Of course, the 140lb paper is a delight to draw, paint, or collage on. So, here are the covers I just created digitally in Photoshop. I'm loving the vintage card. Any comments would be so greatly appreciated! 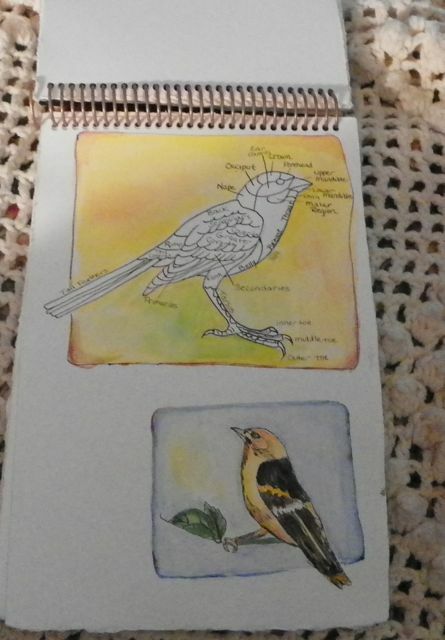 I love the look and feel of the pages of watercolor paper. I included both 140 and 300 pound papers. Makes for a thick, luxurious journal to paint in. This better shows the cover... I did a collage of an acrylic painting I did last year. Photoshop is great... can you see me peeking over the top? Just some sketches. 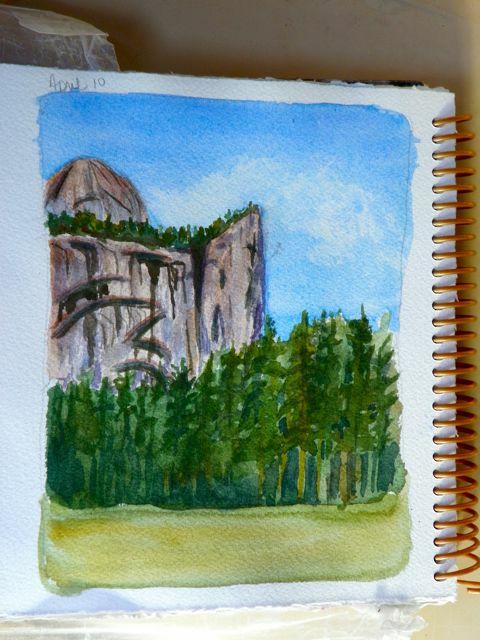 First I did a more realistic watercolor sketch, then tried to do something abstract. 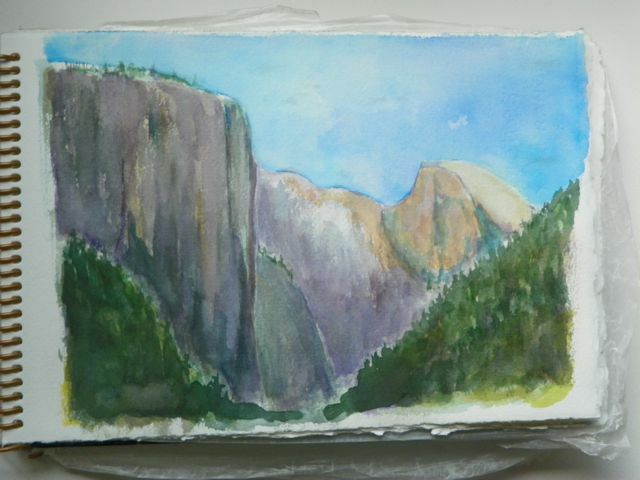 I'm including birds, flowers (not shown) and rocks of Yosemite. It's so amazing, with all the magnificent granite beauty, to just focus down on the small stuff. It pauses time for a moment. 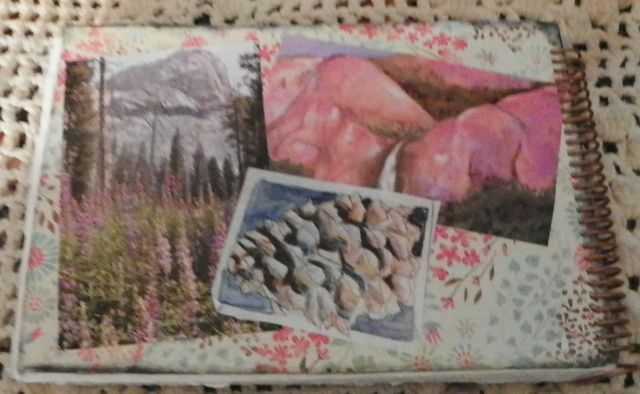 This is the back cover showing more collaged elements. Note the pinecone... that was from a class last year, again, focusing down on the little elements. 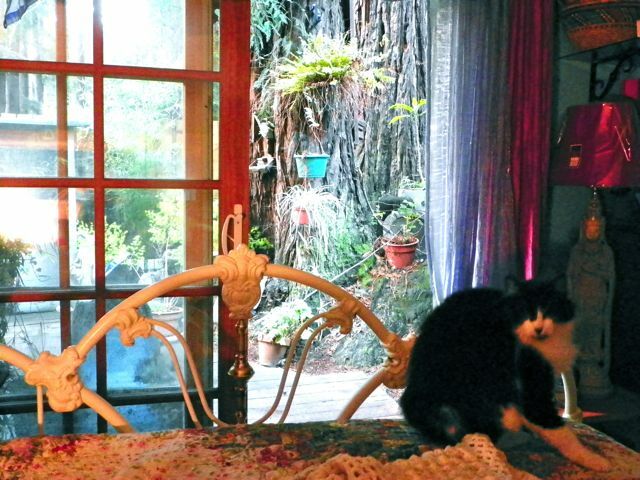 Home again, working in bed, beautiful Redwoods just before the sun comes up. Trixie is taking a stretch. For my occasional reader: I want to share this fabulous site with you. I've been enjoying reading Kindle editions on my little Droid phone. It's amazing to be able to pull it out, especially when I'm caught unexpectedly having to wait for something, too early for an appointment, dining alone, etc. I've read a number of great books lately: Unbroken: A WWII Story of Survival, The Woman Warrior (Maxine Hong Kingston); The Glass Castle (Jeannette Walls); The Florist's Daughter, (Patricia Hampl), and Cutting for Stone (Abraham Verghese) REALLY EXCELLENT, and my favorite read of these past few months. I'm also reading Dicken's Great Expectations. Another thing I love about my Droid/Kindle is that I can change the size of type for easy reading with tired eyes, and I don't need any light since the little screen is lit up. 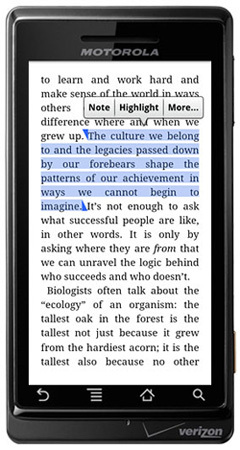 And it's so easy to turn the pages with just touching the right side of the screen. Anyway... I'm excited to have come upon this site recommending free and cheap Kindle books! Enjoy! and Sweet Blessings for a Beautiful Spring Sunday! Finally! the snow stopped falling. It's still quite cold, but at least I can find some sun to warm up in! I'm in the dense Pines campground, so I drive to a sunny meadow first thing in the morning, to watch the sun rise on the granite! It's about 7:30am here. 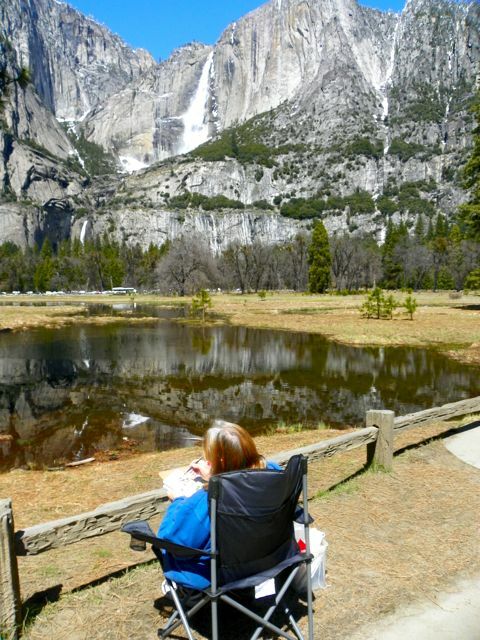 On Sunday, I settle in for a few hours in an amazing spot overlooking the Sentinel Bridge meadow, right onto both the Upper and Lower Yosemite Falls. I was here for about three hours, all the time cars would stop, people would pause and snap a picture or two, then move on, maybe spending five minutes at the most. What they missed, was the changing shadows on the ridges, the sight and the SOUND of the ice breaking away and falling into the cascades below. Many didn't even notice the perfect mirror reflection of the falls in the melting snow waters below (right in front of me). I've painted from this spot during the summer and it's all green grass and wildflowers. Here, the snow has just begun to melt. Here's a closeup of the chunks of ice that break free to loudly crash below. Later that day, I moved to the meadow across from Camp Curry and I try to capture the late afternoon light on North Dome. Here is what I was actually looking at. 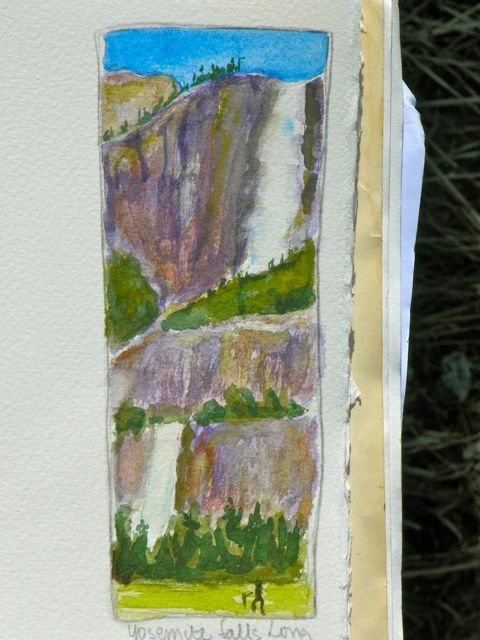 Again, this is a small field study, only about 4x5 inches. 7am: Off to my beloved Yosemite! California is so green and beautiful. I’m here in short time, four and one half hours… but time flew because the scenery was so lush and green. 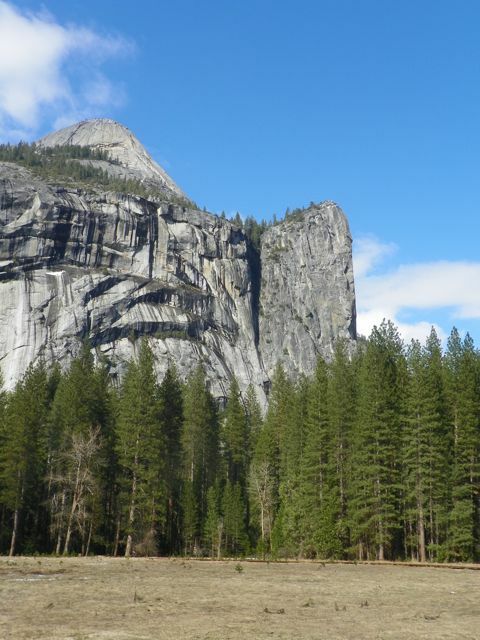 My GPS had me come through the southern route, through Wawona and the Tunnel View…. The snow capped mountains and granite monoliths were fantastic. Then: 1955, in our huge black Pontiac, on our way home after 14 days camping in Yosemite Valley’s Camp 7, mom said to us all “This vacation cost us almost $100!” We felt so rich! Then: No need to pack a box of electronics for MacBook, Digital Camera, Droid. Today: Didn’t pack my ironing board! 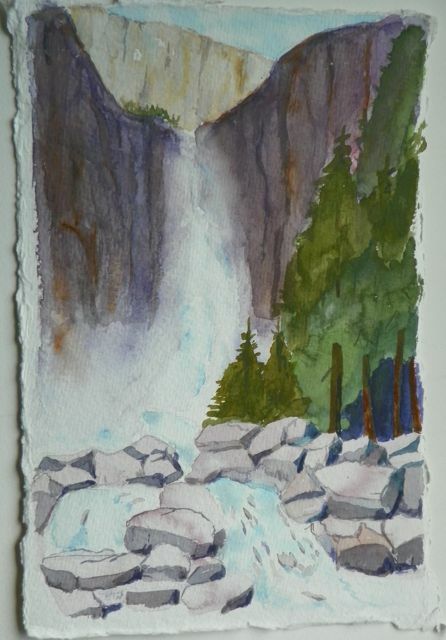 This is Yosemite Falls running very full, on the day I arrived. 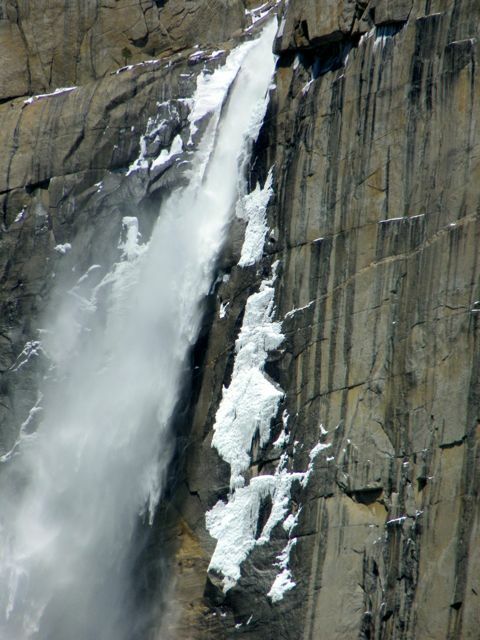 Here is Yosemite Falls today, Saturday.... note the Frazzle Ice on the sides, it piles up at the base of the falls then begins to flow down the river. There’s snow on the ground, melting fast. The weather feels comfortable, like about 60. Art class was wonderful. I finish the day sitting meadow side, watching the snow melt and run down a little stream past my chair. Across the Valley I see Yosemite Falls on the far left, straight across are three springtime only waterfalls. 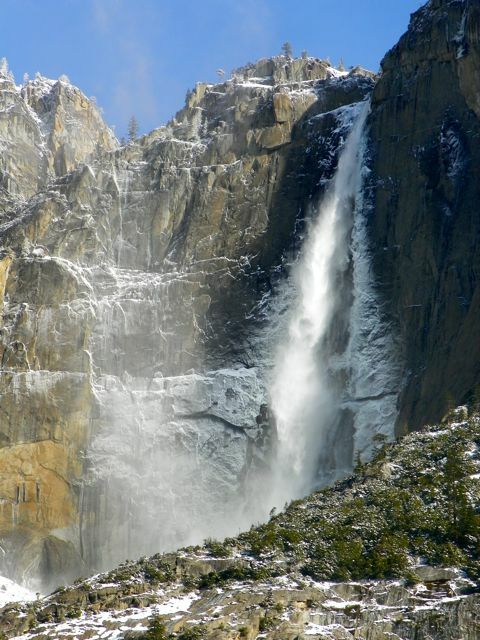 I missed seeing Yosemite in the winter, but I’ve never seen the falls so full! 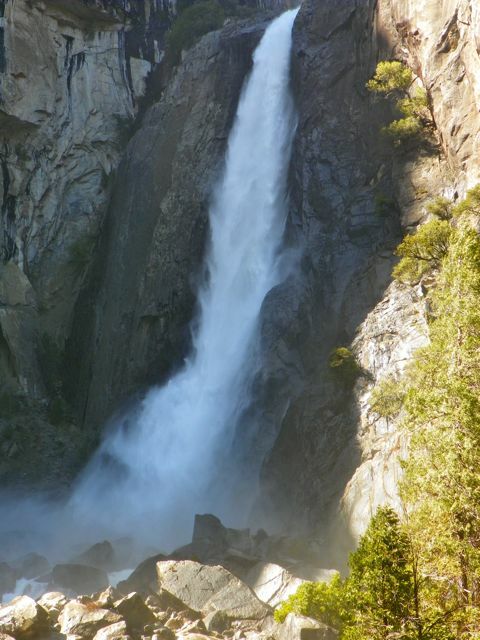 Walked up to the base of lower Yosemite Falls… so much water! The mist is everywhere. Soooo beautiful! Art class was great… mostly kids! But the instructor, Steve Coral, was great. Here’s what I did. Another wonderful art class, mostly kids again. 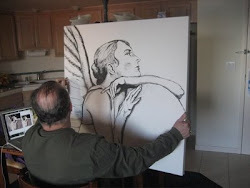 But the instructor is patient with them, and gives me extra attention on the painting I did yesterday. This afternoon, the weather is beautiful, almost warm, even in the shade. I walk in (can’t really call it hiking, darn it) to the base of Bridal Veil Falls. Breathtaking! I watched a photographer take photos with an antique box camera. 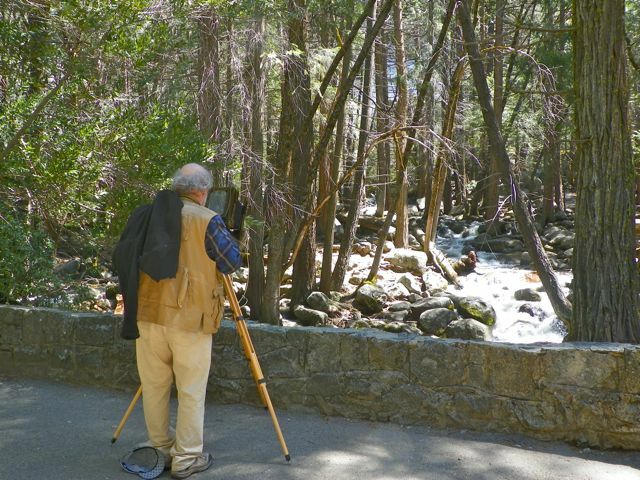 He is a “student of a student” of Ansel Adams. Art class was great again today too. Again, mostly families and children. But the instructor is very good with all levels. 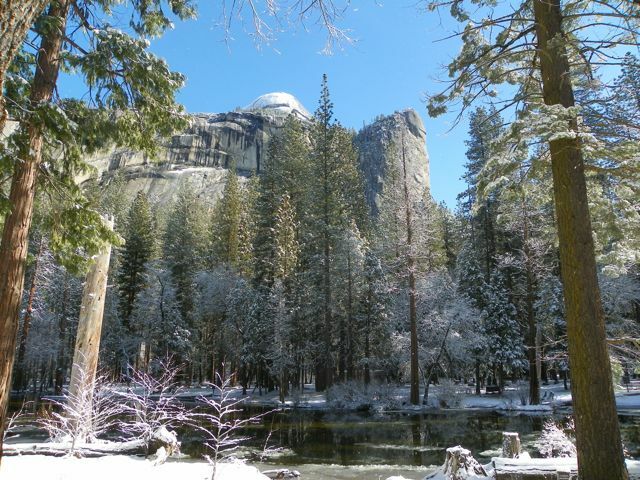 Got to see Yosemite in the winter after all! We were blanketed with 4-6 inches of snow! Can’t even see Half Dome, Glacier Point, or any of the falls, the snow is coming down so heavy. Cold, but lovely. Cold! Then, the heavy, snow laden branches began to bend, engulfing what ever, camper, tent, or people, beneath with a blanket of snow. Still, beautiful. Still cold! Gonna do my own thing today… just reading! Love it! I’m so snowed in! Couldn’t even get my driver-side door open, frozen shut. Driving in the snow, 4-6 inches. I like what I did today in class! Day 6th, New campsite, right on the river. Watching Frazzle Ice right from my camper. It is sooo cold. I ran out of my third canister of propane. Today is the last day of Art class. All adults this time! Met some wonderful people. Here’s what I painted today. 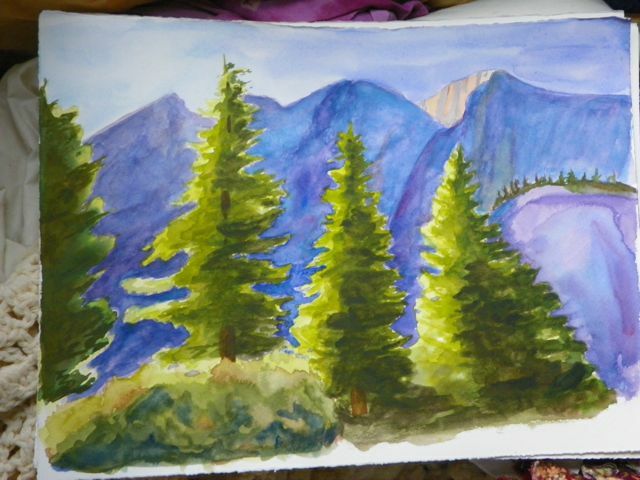 It’s not complete yet, needs more blue in the far granite wall and more sunlight on the left side of the trees. One more day left. I hope the sun comes out. 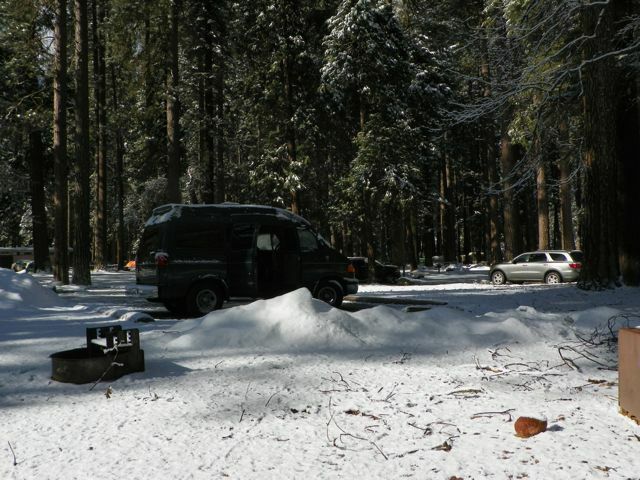 I’m glad I got to see Yosemite in the snow… but I’ve done that now. Where is the warm spring weather? Here's the view from my campsite. 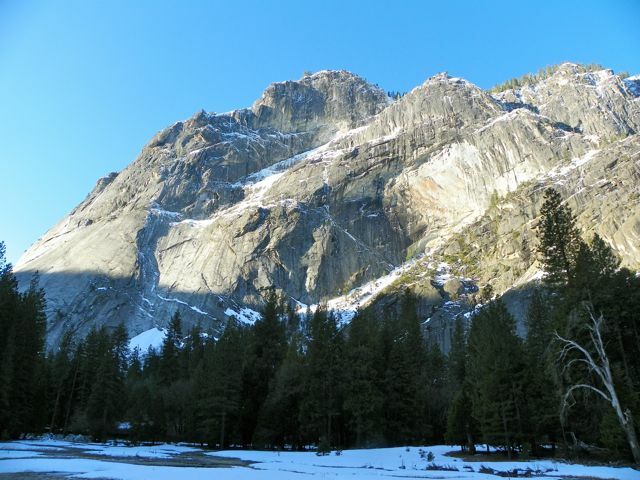 You can see the Frazzle Ice floating down the Merced River.